Launched November 26, 2011, Curiosity is the largest and most capable rover ever sent to Mars. Unlike its predecessors, Curiosity utilized its wheels as landing gear rather than airbags when a rocket-powered descent lowered it directly onto the Martian surface via a tether. NASA dubbed the landing as “Seven Minutes of Terror“. But, the new precision landing gear allowed NASA to practically pinpoint a site compared to previous explorations. 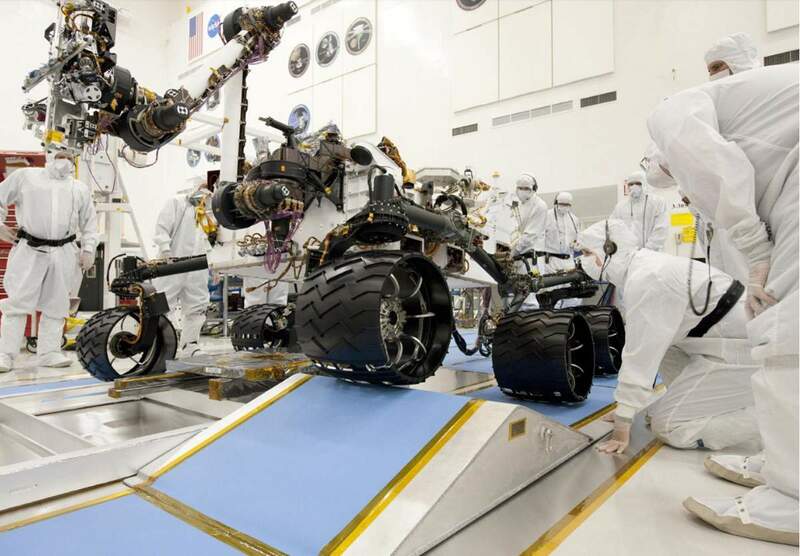 And, Curiosity’s titanium rocker-bogie suspension system will prevent it from tipping while navigating the rocky terrain during its mission. Curiosity is equipped with six 50 cm (20 in) diameter wheels in a rocker-bogie suspension. Each wheel has cleats and is independently actuated and geared, providing for climbing in soft sand and scrambling over rocks. Each front and rear wheel can be independently steered, allowing the vehicle to turn in place as well as execute arcing turns. Each wheel has a pattern that helps it maintain traction but also leaves patterned tracks in the sandy surface of Mars. That pattern is used by onboard cameras to estimate the distance traveled. The pattern itself is Morse code for “JPL” (·— ·–· ·-··). The rover is capable of climbing sand dunes with slopes up to 12.5°. Based on the center of mass, the vehicle can withstand a tilt of at least 50° in any direction without overturning, but automatic sensors will limit the rover from exceeding 30° tilts. Curiosity can also roll over obstacles approaching 65 cm (26 in) in height, and it has a ground clearance of 60 cm (24 in). Founded in 1986 in Ooltewah, Tennessee, Litespeed makes titanium and carbon fiber frame road racing bicycles and mountain bikes. Titanium bicycle frames are famed for their ride quality. This is a full-resolution version of the NASA Curiosity rover descent to Mars and landing, taken by the MARDI descent imager. As of August 20, all but a dozen 1600×1200 frames have been uploaded from the rover, and those missing were interpolated using thumbnail data. The result was applied a heavy noise reduction, color balance, and sharpening for best visibility. The video plays at 15fps, or 3x realtime. The heat shield impacts in the lower left frame at 0:21, and is shown enlarged at the end of the video. This 11-minute animation depicts key events of NASA’s Mars Science Laboratory mission.